Shipping can make or break deals. If your customers are satisfied with your shipping setup, you can expect them to be a repeat customer. They can also be a source for new customers because of the great shopping experience you offer your present customers. So making a mistake with your shipping strategy would be the last thing you want. You’ll need the best shipping carriers, a fast online API, and an automatic shipping solution to increase the accuracy throughout the process. ELEX EasyPost Shipping Method Plugin for WooCommerce helps you integrate the best shipping carriers like USPS, FedEx, and UPS with advanced RESTful API which is fast and provides a completely automated solution. Unlike USPS online API, EasyPost provides an automated solution even for insurance cover and refunds too. The plugin will reduce paper works and your visits to a physical post office or a shipping carrier’s office. Let’s see how the EasyPost Shipping Plugin Method for WooCommerce helps you in providing a diverse, fast and accurate shipping solution for your online store in detail. Offer free/flat rate shipping and print labels for those order using services from USPS, FedEx and, UPS. 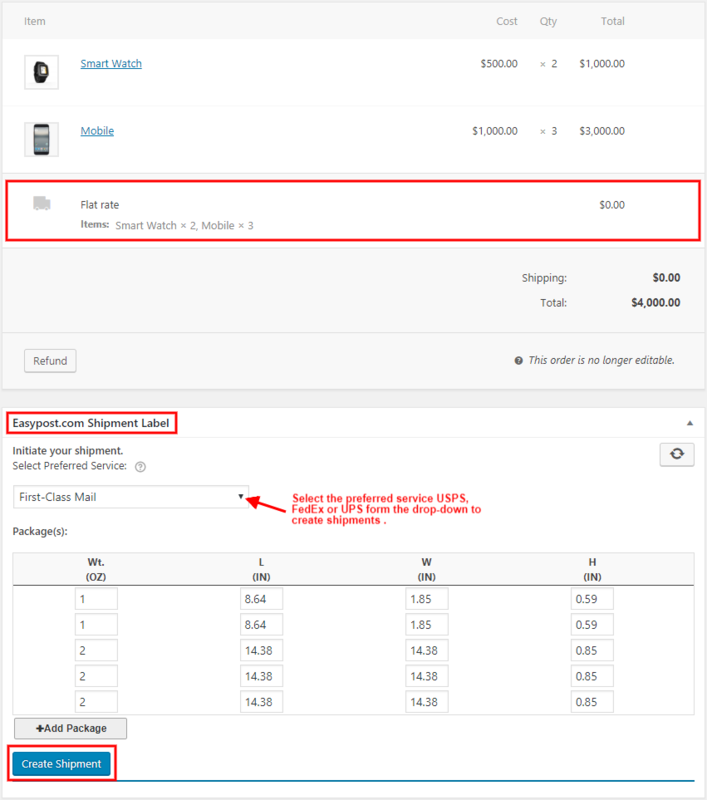 If you select all the ‘EasyPost Carrier(s)’, the cart and the checkout page will have the rates from them. These rates come straight from the carriers you choose (screenshot above). If you have a different pricing plan from FedEx and UPS and you choose ‘Commercial’ for ‘Rates Type’ it will show prices according to your pricing plans. In the case of ‘Residential’, FedEx and UPS will show the regular rates. In the case of USPS, selecting ‘Commercial’ will show the Commercial Plus Pricing and selecting ‘Residential’ will show the retail USPS shipping rates. All the shipping rates are based on the product’s shipping dimensions & weight, the destination and the service chosen for creating the shipments. Let’s see what these three carriers have to offer individually. Slashed Shipping Rates from USPS with no weekly/monthly limit in shipping volume. Printing USPS shipping labels from your WooCommerce Dashboard without registering to e-VS.
You can connect your existing FedEx Business account by entering integration API in a simple EasyPost Dashboard. If you have a business account that offers you a personalized pricing plan, you can add the same account to EasyPost. This does not change your pricing plan with FedEx. Or you can refer to this FedEx integration guide. Just like FedEx, you get to add your existing UPS account and maintain the same pricing plan to your EasyPost account. This UPS integration guide will help you make the integration easy. With the option to offer different services at your fingertips, you can go for higher negotiations with the carrier and get a better quote. The good thing about the business accounts from FedEx and UPS is that they offer pricing plans that suit your business size and needs. 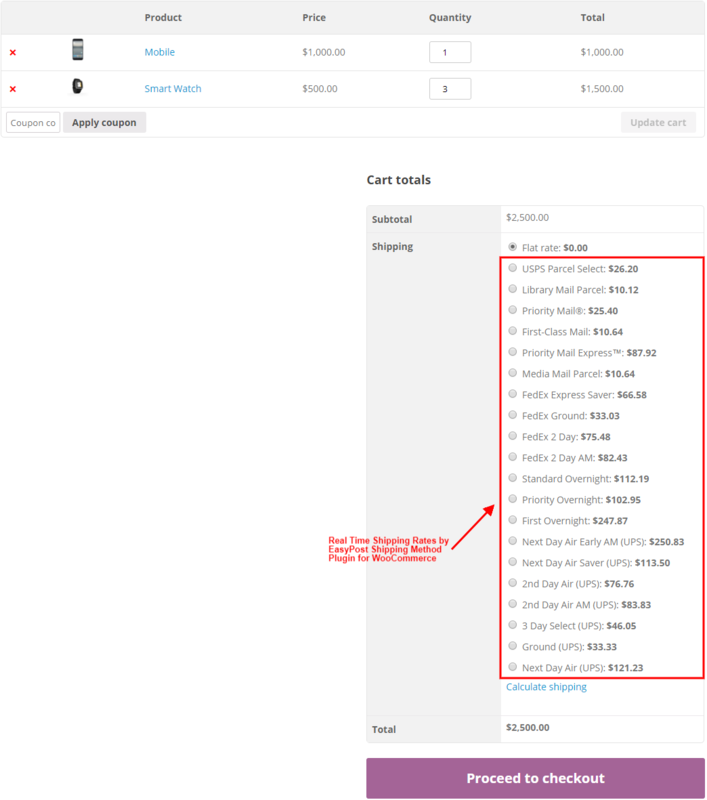 So if you pull out a great deal with them, the shipping rates you’ll show to your customers will be based on the pricing you get from the carriers. And you already get a Commercial Plus Pricing by USPS, which is quite lower than the rates offered by Stamps.com and the commercial rates by USPS. A slight reduction in the pricing is going to lower the shipping rates you offer to your customers, which will give you an edge over your competitors. EasyPost Shipping Method Plugin provides a wide range of services even if the orders were not placed using any service from USPS, FedEx or UPS. Free shipping and Flat rate shipping are good examples for this. Consider the times when you are offering free or flat rate shipping to your customers. In those cases, you may not want to show shipping option on the cart and checkout pages. But to ship the products, you’ll still require a shipping carrier to ship the packages. You may also want to print shipping labels from your dashboard, offer tracking services, and other services like insurance, address validation etc. to your customers. EasyPost Shipping Method Plugin is a perfect way to do this. The plugin helps you create shipments using USPS, FedEx and UPS services for such orders, print labels accordingly, and send automatic tracking messages to your customers from your WooCommerce dashboard. You can also use our Stamps.com Shipping Plugin to print USPS shipments for orders placed with Free and Flat rate shipping. E-commerce requires the assistance of technological advancements. These are important as they help you offer competition to the tech-savvy peers. An effective integration helps you analyze, track and fulfill a large number of orders you receive. If you are not upgrading your technology or using the most advanced shipping integration, your rivals and your customers will knock you out of business. EasyPost is one such technology partner, as it automates each step involved in your shipping process. Let’s explore more about this. Let’s start with taking the example of Insurance with USPS. First, USPS doesn’t offer insurance as part of their online API. So if you want to offer insurance of packages through USPS and you are not using EasyPost, you’ll need to go to a USPS PostOffice and buy insurance personally. That is just one example, there are other instances where your EasyPost account comes in handy. These include the services like the refund of USPS labels and address verification. These additional automatic services is a big plus considering the importance of Shipping Insurance, Address Validation, and Refunds of USPS labels. EasyPost provides a robust and highly functional integration of with its API. Starting from live shipping and printing of labels from multiple shipping carriers to tracking the shipments, you can do it all using EasyPost. Only place other than your WooCommerce dashboard, you’ll need to visit will be the EasyPost dashboard to maintain your shipping accounts. You get real-time shipping rates directly from USPS, FedEx, and UPS. EasyPost fetches these rates from the respective carriers and displays them to your customers. No matter which carrier you are using, the rates displayed are what you choose to show i.e. if you choose residential rates in the settings only retail rates will be shown to the customers. Similarly, if you choose commercial rates, the plugin is going to show USPS Commercial Plus Pricing and the contracted rates by FedEx and UPS. These rates are accurate as long as you provide the correct shipping weights and dimensions to your products. The rates shown will vary if the actual measurements differ from the entered measurements. So you can see that the plugin helps you manage 3 different types of shipping carriers without affecting the other. It also helps you manage your multiple accounts with 100% accuracy. Address validation reduces the chances of failed or wrong deliveries by up to 60%. Considering the probability of situations where a wrong address was entered by the customer, address validation is a must-have feature for an e-commerce store. Along with Google Auto-complete feature, the address validation becomes more effective as it incorporates the type-ahead behavior while your customers enter the addresses. They’ll get suggestions that fill the rest of the boxes automatically based on cached data and the Google database. Address validation with the plugin is done on a real-time basis which ends with automated verification of the customer’s address. This assures that only the correct address is entered by them and you can send the packages without any second thoughts. Geocoding, which converts any address into geographic coordinates (latitudes and longitudes), remains an integral part of the entire process of address verification with the plugin. This eliminates any confusion raising from matching words or street numbers in any address. So your carriers get a precise location for making the deliveries. This is one of the many ways EasyPost provides accuracy to shipping. EasyPost provides the delivery signature feature for all the three different shipping carriers. Once you enable this, the carrier used to create the shipment will be getting the signature automatically. You can enable this feature at the product level too. 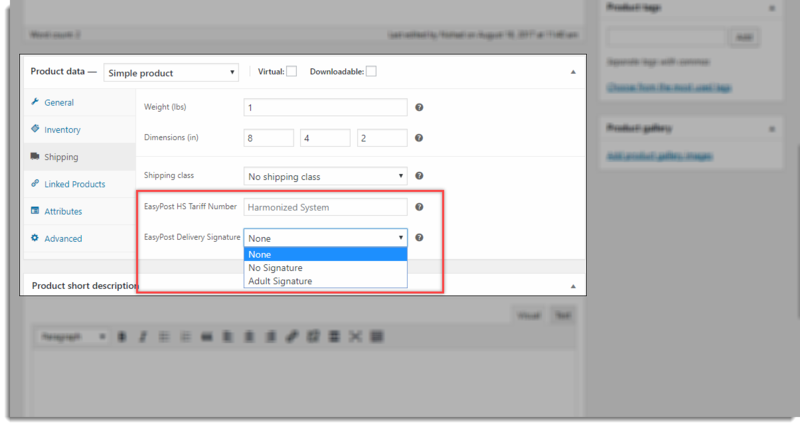 This makes it easier to enable delivery signature when it is required for particular products like alcohol or some important document. This is also a way to be sure that packages reach the right customer. You get to specify if you just want a signature or you want an adult signature. With a technology that makes shipping services more accessible to shippers and customers, it has helped e-commerce store owners improve their shipping experience. Without repeating the feature of the plugin, I would say that the ELEX EasyPost Shipping Method Plugin is a must have plugin if you want to have a diverse, fast and accurate shipping solution for your WooCommerce store. If you are yet to have this awesome plugin, get it soon as you might miss a lot of helpful features.